She could tell that C. had not completely recovered from yesterday’s hard hitters, so T. smartly announced that she needed time to prepare the luggage today, for tomorrow’s transfer. And anyway, she added, if he wanted a fair chance of getting up the Monte Zoncolan in one piece, he’d better take it easy today. That did not fell on deaf ears, as C. already picked the Fedaia as probably his only climb for the day. 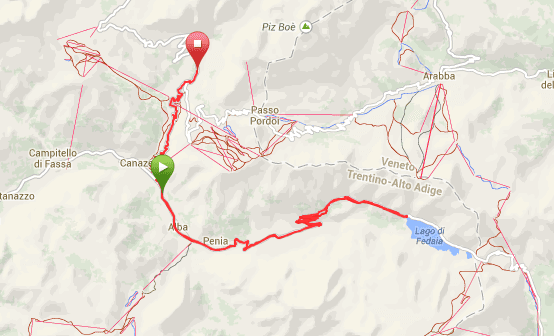 So, they went over the Sella by car and in Canazei he started his ride. This pass is not so bad from that end (profile) – from the other side, starting in Caprile, it looks much worse (profile). Still, C. could tell very quickly after the start that today was not his day and he took it easy. At the summit of the Fedaia, there was nothing much worth mentioning and as it was too early to eat something, he went back down. Since the bottom part of the Pordoi was not climbed during the Mapei Day, in Canazei he followed the directions to the Sella and Pordoi passes. Shortly after the split – at Rifugio m. Pallidi – he put the bike back on the car. Totals: 27.8 km / 1,168 altimeters.